With added sugars highlighted on the updated Nutrition Facts label panels, product developers face increased pressure to reduce them in foods and beverages. Sugar substitutes and other tricks can maintain a sweet taste and functional performance. With rising health concerns over the role of sugar in people’s diets, municipal soda taxes and the obesity issue, reducing sugar, and especially added sugars, is increasingly top of mind among product developers. The 2018 Nutrition Facts Panel's call-out of added sugars should be the final straw for many. 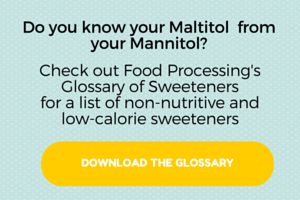 Mintel's (www.mintel.com) 2017 Consumer Trend report "The Sweet Hereafter" predicts the food and drink industry will face continued challenges reformulating and developing new, healthier products with reduced-sugar and sugar-free formulations. The firm's top consumer trend for 2017 is the backlash against sugar – which also presents opportunities for alternative sweeteners. Reformulating foods is tricky enough, but reducing and replacing sugar is especially difficult because sugar not only adds sweetness but has functional qualities that contribute to a finished product's taste, appearance, aroma and mouthfeel/texture. Ready-to-drink tea always was in a good place as a healthy beverage alternative to fruit juice and carbonated soft drinks, but recent growth is being spurred by low-sugar and premium varieties, Mintel says. RTD developments and the growing awareness of tea's health benefits and cultural importance are thriving in the U.S., but future growth will rely on new products and innovative marketing, according to new research from Packaged Facts (www.packagedfacts.com), Rockville, Md. High-sugar sodas and fruity drinks are losing shelf space to beverages such as water, cold-brewed coffee and tea – as well as to specialty drinks that promise energy, nutrition and satiety while being formulated with fewer, simpler ingredients and less calories from sugar, according to IRI (www.iriworldwide.com), Chicago. Traditional beverage companies are responding. Once, both Coca-Cola and PepsiCo had a single diet cola each. Now, Diet Coke has been joined by Coca-Cola Zero (sweetened with an aspartame-acesulfame potassium blend) and Coca-Cola Life (sweetened with stevia, but containing enough cane sugar to contribute 90 calories per 12-oz. serving). Responding to critics of aspartame, Pepsi in mid-2015 reformulated Diet Pepsi with sucralose and acesulfame potassium … and sales declined. So the company recently relaunched Pepsi Max as Pepsi Zero Sugar (it has aspartame), and Pepsi's stevia- sweetened, reduced calorie offering is Pepsi True (100 calories per 355-ml can, versus 150 calories in regular Pepsi). Pepsi also recently created a new brand, a "craft' beverage called Stubborn Soda, that combines stevia with Fair Trade Certified cane sugar for 90-100 calories per 12-oz. bottle. Soda makers also are motivated by municipal taxes on sugar-sweetened beverages. Philadelphia and Berkeley, Calif., were the first cities to enact such taxes, 1.5 and 1 cent per ounce, respectively. Voters in three Bay Area cities -- San Francisco, Oakland and Albany, Calif. — as well as Boulder, Colo., approved such ballot initiatives last November. Removing sugar should remove the taxes in those municipalities – although in Cook County, which includes Chicago, the county's board's pending soda tax even includes even diet soft drinks. Kraft Heinz reformulated its Capri Sun drink pouches so they now have 25 percent less sugar. Beverages isn't the only category focusing on sugar reduction. Fruit-based bars incorporate fruit as a binder and a sweetener, enabling such snack bars to make "no added sugar" claims that resonate with increasingly sugar-wary consumers, Mintel says. Post Holdings, St. Louis, recently launched its PowerBar Clean Whey line of protein bars and drinks, which are made with no artificial sweeteners. The bars have just 2g of sugar and the protein drink has zero sugar. Both use stevia as a no-calorie sweetener. Dannon Foodservice (www.dannonfoodservice.com), White Plains, N.Y., is lowering sugar on most of its yogurt lines from 19g on average to 14g per 5.3-oz. cup. The Oikos Greek nonfat line will have 2 percent less sugar than before, affirms Courtney Firlit, senior manager of portfolio strategy & innovation. The retail Oikos line, such as Oikos Triple Zero Yogurt, is sweetened using various ingredients such as stevia, chicory root fiber and a lactase enzyme. Triple Zero contains no fat or added sugar and has no artificial sweeteners. Though non-sugar/non-nutritive sweeteners abound, one of the biggest obstacles for any alternative sweetener is replicating the taste and texture of table sugar. The first generation of stevia didn't quite meet that expectation, but subsequent versions have removed the bitter, metallic taste sometimes found. As a result, use of the plant-based sweetener has grown at least 12 percent over the few years to reach nearly $430 million in 2015, says market researcher Technavio (www.technavio.com). The market for stevia blends with other artificial sweeteners should grow at a compounding rate of 8.82 percent from 2016 to 2020, the analysts forecast. Cargill took an early lead in the tabletop market with its Truvia brand of stevia. More recently, Cargill has blended Truvia with honey, brown sugar and regular sugar. Tate and Lyle initially staked its claim on sucralose, and its Splenda sweetener established itself early this century on restaurant tabletops. Consumer versions of Splenda now pair it with stevia, as well as with brown sugar and regular sugar. The British/Hoffman Estates, Ill., firm helped bring monk fruit (luo han guo) to this country and established the Purefruit brand. The company dabbles in stevia with its own Tasteva brand. And it created some fanfare in 2015 when it introduced Dolcia Prima, a form of allulose, a novel sugar found in small quantities in wheat and other commodities. Matsutani also launched an allulose sweetener in 2015 called Astraea. Luis Fernandez, senior vice president, global applications at Tate & Lyle (www.tateandlyle.com), Hoffman Estates, Ill., knows, replacing sugar isn't simple. "High-potency sweeteners, such as stevia and monk fruit extract, enable manufacturers to drastically reduce the sugar content of products without compromising taste. But because these sweetening ingredients are used in such small quantities in formulations, they don't provide functional attributes, like bulk and mouthfeel. Combining sweetening ingredients enables manufacturers to reduce calories and sugars and deliver the taste and texture experience consumers expect." Fernandez suggests beverage formulators combine sweetening ingredients to balance them out and achieve a sugar equivalent. "Replacing sugar in dairy products can mean a loss of solids or bulk. High-potency sweeteners can be formulated with bulking agents to make up for this loss," he adds. Food scientists at Nestle (www.nestle.com), Vevey, Switzerland, which markets Crunch, Kit Kat, and Butterfinger candies, last year altered the molecular structure of sugar in such a way that it dissolves faster on the tongue than regular sugar. According to the company, this increases the perception of sweetness and can reduce the amount of sweetener used in candy bars by 40 percent. "It's truly groundbreaking research inspired by nature, and has the potential to reduce total sugar by up to 40 percent in our confectionery," adds Stefan Catsicas, Nestlé chief technology officer. "We're working on reducing sugar across our food and beverage portfolio, which includes baking, confections, snacks, beverages, ice cream, pizza and prepared foods," adds Emily Dimiero, Nestle corporate affairs spokesperson. "The biggest challenge is maintaining the same taste. It can also be a challenge to maintain texture and functionality. In ice cream, sugar functions to balance flavors, such as counter-balancing acidity from added fruit and create a creamy texture." Nestle has been able to reduce sugar by an average of 11 percent in its Outshine frozen fruit bars, with more flavors to come, she says. Chicory root fiber, fruit ingredients, honey and sweet potato ingredients are all replacements for both artificial sweeteners, sugar and non-nutritive sweeteners, depending on the application. Global agricultural company S&W Seed Co. (swseedco.com), Fresno, Calif., has trademarked a stevia brand Kandi Leaf, using research and seed breeding techniques. The company has applied for patent protection on two unique, proprietary fresh and dry-leaf Kandi Leaf varieties, says CEO Mark Grewal. "We intend to build a portfolio of proprietary stevia varieties that can add value at the front end of the supply chain to address the rapidly growing stevia market." The varieties not only have a sweet taste with very little bitterness and aftertaste, but exhibited more Reb-A, less stevioside, more total steviol glycosides, a higher Reb-A to stevioside ratio, and a higher percentage of Reb-A to total steviol glycosides than comparison samples from common varieties, he added.